Thank you for choosing Sport24 to catch the opening match of the 2018 Soccer World Cup between Russia and Saudi Arabia. When you realise there's another 63 #WorldCup games to go! Russia’s victory means that the host nation has never lost their opening match in any of the 21 editions of the FIFA World Cup (W16 D6 L0). Saudi Arabia have conceded 14 headed goals at the World Cup since their debut in 1994, that’s five more than any other team over that period (USA - 9). 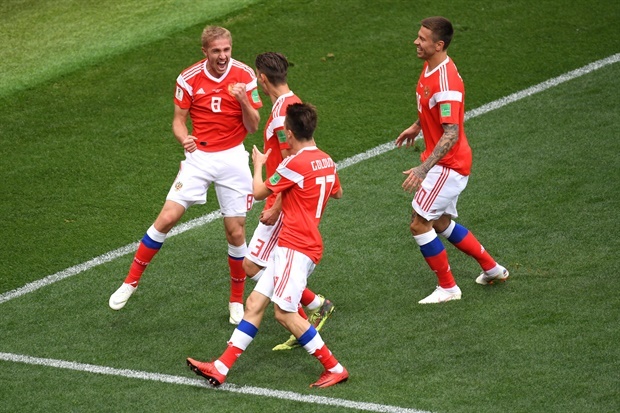 Russia’s Denis Cheryshev became the first-ever substitute to score a goal in the opening match of a World Cup tournament. 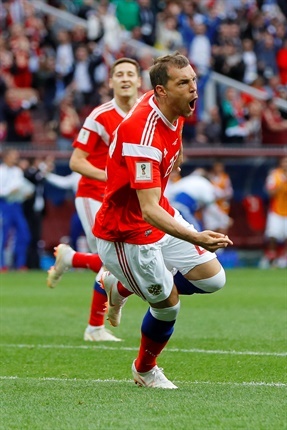 Artem Dzyuba scored for Russia just 89 seconds after coming off the bench; the quickest goal by a substitute at a World Cup since Marcin Zewlakow for Poland vs USA in 2002. Russia have thrashed Saudi Arabia by five goals in the opening game of 2018 Soccer World Cup. In a match that not many fans were interested in, the goals were certainly special. Aleksandr Golovin curls in a beauty free-kick to round off a perfect night for the hosts. What a freaking goal! Cheryshev's second goal of the night is memorable! 85' Saudi Arabia substitution: Muhammad Al-Sahlawi off, Muhammad Asiri on. 82' No way for the Saudi's to get back into this match. They have a lot to work on in training ahead of their next match. 78' Saudi substitution: Yahya Al-Shehri off, Hatan Bahbri on. Substitute Artem Dzyuba makes an immediate impact by tucking home Russia's third goal of the match with sweet headed strike. 69' Russia look comfortable as they slowly find their rhythm. Saudi Arabia are repeating the same mistakes as the first-half. 67' SCRAMBLE! Abdullah loses Golovin's strike but his Saudi Arabia defence is quick to clear the ball. 58' Saudi Arabia get a free-kick in a good position and Al-Jassim curls the ball across the penalty area... Salman Al-Faraj’s rises and connects it pretty decent but can't keep his effort down. 56' Saudi seeing much of the ball in the second-half as well. They need to halt Russia's counter attack, refrain from losing the ball and create chances. 51' Golovin takes a shot from afar only to see his effort go narrowly wide. 49' CHANCE! Yuri Zhirkov plays a long pass for Smolov to chase but all he can do is win a corner. Zhirkov sends the ball into the penalty area only for Osama Hawsawi to clear the danger with asserting header. 48' Three of Russia's last five World Cup goals have come from substitutes. 47' No team has even come back to win after trailing by two goals at half-time at the World Cup. But can Saudi Arabia do it? Denis Cheryshev makes it look easy as he scores his first international goal after brilliant footwork in the 18th area. 36' PENALTY SHOUT! Osama Hawsawi saves the Saudi's with last-ditch lunge on Fyodor Smolov and the referee waves play on! 32' Saudi Arabia have too calm down. The occasion seems to be getting to their heads. Hopefully come out better in the second-half. 30' Russia have been doing well in the middle of the park stopping counter attacks and picking up loose balls. Saudi's have to show more precision in the final third. 27' Salem Al-Dawsari tries a shot from distance for Saudi Arabia but it goes well over the cross bar. 23' First substitute of the match as Dzagoev comes off after pulling his hamstring. Cheryshev replaces the injured player. 20' SO CLOSE! Yasser Al-Shahrani of Saudi Arabia whips in a searching crosses towards Mohammad Al-Sahlaawi, who gets a slight nick on it with his head but his effort is just wide of goal. Full time in the opening game of the World Cup and Russia have come away comprehensive 5-0 winners. The hosts were a dominant force the whole way throughout the game with Saudi Arabia not giving Akinfeev a save to make. GOAL! Golovin steps up to take the free kick and he curls it beautifully over the wall to find the back of the net as Al-Maiouf isn't able to get across to make the save. 5-0. Yellow card as Al-Jassim goes into the book for a foul on Golovin just outside the Saudi area. GOAL! What a goal from Cheryshev! Russia looked to attack down the left before the ball was played inside for Cheryshev. He decided to strike at goal with the outside of his left foot from the left edge of the box and it sailed into the far corner. 4-0. The referee has the yellow card out for the first time in the game as Golovin goes into the book for a trip on Al-Faraj in midfield. Russia have a free kick on the left side of midfield which Zhirkov delivers into box. It's flicked on towards the far post where Gazinskiy is lurking, but the visitors are just able to get the ball behind for a corner. Substitution for Saudi Arabia as Al-Sahlawi is replaced by Asiri. SHOT! Saudi Arabia have not given up as they move forward well before Al-Sahlawi is found on the right wing. He attempts to cut inside before shooting from the edge of the box, but Ignashevich is there to get his body in the way and make the block. Dzyuba does well to win the ball in midfield before charging down the right wing. 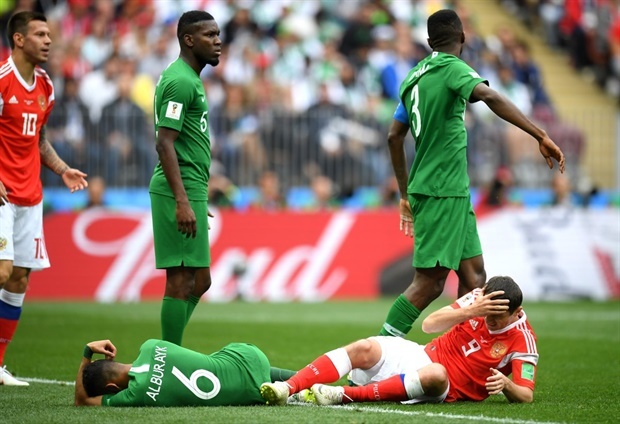 He finds Golovin, who attempts to cross for Cheryshev, but Saudi Arabia do well to cut it out and clear the danger. WIDE! Russia win a free kick down the right flank which Golovin looks to deliver into the box. He puts it into a crowd of players on the penalty spot and Gazinskiy meets it, but his header is wide of the target. Substitution for Saudi Arabia as Al-Shehri comes off to be replaced by Babhir. GOAL! What an introduction! Russia work the ball well from a throw in on the right wing before the ball is crossed in by Golovin and Dzyuba is there to head the ball into the bottom corner, one minute after coming on. 3-0. Substitution for Russia as Dzyuba comes on to add a bit of presence to the Russian front line as he replaces Smolov. SHOT! Zobnin does well to burst forward in midfield before shooting across goal towards the far corner from the edge of the box. Al-Maiouf gets across to save, but he's lucky as Smolov just isn't able to get to the loose ball after the keeper fumbled. Golovin does well to find space down the left flank before crossing towards the edge of the box, where Cheryshev attempts to head the ball towards goal. The header lacks power though and it loops into the hands of Al-Maiouf. Saudi Arabia are making their first change of the game as Otayf comes off to be replaced by Al-Muwallad. Russia also make a change as Samedov comes off to be replaced by Kuziaev. Saudi Arabia have another opportunity to get the ball into the box as Al-Sahlawi delivers a free kick towards Al-Faraj. He attempts to head the ball towards goal, but it goes over Akinfeev's bar. CHANCE! Saudi Arabia have another good spell of possession before the ball is shifted to the right wing and crossed across the face of goal by Al-Dawsari, but Al-Sahlawi just isn't able to get a touch on the ball to divert it goalwards. SHOT! Russia move the ball forward quickly before it's played to Samedov on the edge of the Saudi area. He strikes at goal from around 25 yards, but the effort was always going a yard or two over the bar. It's been a slow start to the second half with Saudi Arabia holding the ball at the back for most of it. Russia are pressing forward well while also keeping their shape and the visitors are finding it difficult to break down. We're back underway for the second half with neither side making any changes at the break. Half time in the opening fixture of the 2018 World Cup and the hosts go into the break with a 2-0 lead after goals from Gazinskiy and Cheryshev. 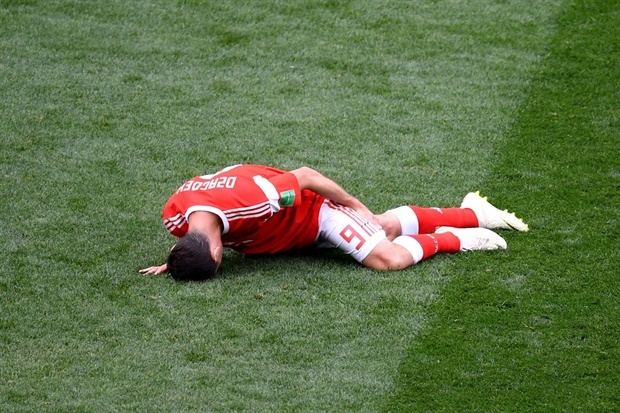 It's been the perfect start for Russia bar the injury to Dzagoev, who limped off with a hamstring problem. GOAL! Golovin does well to run onto the loose ball on the right side of midfield before passing across the edge of the box to Zobnin, who then laid it off for Cheryshev, who did well to skip past two players in the box before rifling the ball in. 2-0. The header from Gazinskiy remains the only shot on goal so far. Saudi Arabia have improved after a difficult start, but the game has lacked quality in the final third. Russia are nearly able to break forward with Golovin taking on Osama in the box to try and make space to shoot. Osama does well get a foot on the ball in denying Golovin, who went down to try and win a penalty unsuccessfully. Saudi Arabia have a chance to get the ball into the box from a free kick after a foul from Zhirkov. Al-Faraj delivers it into the area where Al-Sharani meets it, but his header loops well over the bar. Saudi Arabia are nearly caught out after trying to play out from the back. Cheryshev picked up the loose ball before beating two men and attempting to cross low into the box, but the visitors are able to clear. Substitution for Russia. Dzagoev has gone down grabbing his hamstring and is unable to continue. He's replaced by Cheryshev, who plays his football in Spain for Villareal. CLOSE! Saudi Arabia break down the left flank before the ball is crossed in towards Al-Sahlawi in the box. He competes with Kutepov and the ball is diverted just wide of the goal off of the defender. CHANCE! Russia break down the right before Smolov is found with a low cross towards the near post. He diverts the ball goalwards, but Al-Maiouf is able to get across to palm the ball away from the far corner. GOAL! Russia take the lead! A cleared corner from Saudi Arabia goes as far as Golovin on the edge of the box. He plays it wide to Zhirkov before getting the ball back again and finding Gazinskiy with a cross, and the midfielder heads home. 1-0. Russia have another corner after Saudi Arabia are forced to clear the ball behind. Zhirkov takes it, but it's well over hit as it clears everyone in the box. Saudi Arabia attempt to counter, but a misplaced pass brings the attack to an end. Russia do well to move the ball across the Saudi Arabia box from left to right before looking to get into the box, but Osama does brilliantly for the Saudi Arabians as he makes a great challenge in the box to clear the danger. Russia have had the majority of the possession in the opening few minutes and manage to win a corner, but it comes to nothing as the ball in towards the near post is headed away easily by the Saudi Arabia defence. The anthems have been completed and we're underway at the Luzhniki Stadium! This is the first ever competitive fixture between these two nations, with their only ever other encounter being a friendly in June of 1993. Saudi Arabia came away as 4-2 winners on that day, are we in for another goal fest? Neither team comes into this encounter with much form to build on as they look to get their World Cup campaign off to a winning start. With the opening ceremony completed, we're just a few minutes away from kick off. Saudi Arabia XI: Al-Maiouf, Al-Breik, Omar Hawsawi, Osama Hawsawi, Al-Shahrani, Al-Faraj, Otayf, Al-Jassim, Al-Shehri, Al-Dawsari, Al-Sahlawi. Russia XI: Akinfeev, Fernandes, Kutepov, Ignashevich, Zhirkov, Gazinskiy, Zobnin, Samedov, Golovin, Dzagoev, Smolov. Good afternoon and welcome to our coverage of the opening fixture of the 2018 FIFA World Cup as hosts Russia take on Saudi Arabia at the Luzhniki Stadium!